Dianne Tolliver compiles stories of God’s unconditional love and power in the face of adversity. Within the pages of Dianne Tolliver’s new book, Living Through Troubled Times: Witnessing The Rainbow, ($16.49, paperback, 9781545607350; $7.99, e-book, 9781545607374; $31.49, dust jacket, 9781545607367) readers will find the inspirational journeys of twenty-one courageous people who successfully overcame seemingly insurmountable obstacles in their lives and personally witnessed God’s love and support. From stories of losing a job, surviving a heart transplant, and beating stage-four cancer, each story is written to inspire. Dianne Tolliver is an inspirational speaker and leadership coach. She enjoyed many years in the corporate world holding various executive positions before transitioning into her new phase of life as an author and consultant. Xulon Press, a division of Salem Media Group, is the world’s largest Christian self-publisher, with more than 12,000 titles published to date. 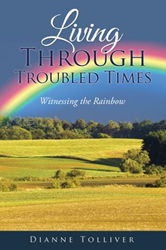 Retailers may order Living Through Troubled Times: Witnessing The Rainbow through Ingram Book Company and/or Spring Arbor Book Distributors. The book is available online through http://www.xulonpress.com/bookstore, http://www.amazon.com, and http://www.barnesandnoble.com.